Upcycled Holiday Decoration - Plus More! Ahhh, wouldn't it be nice if we could upcycle holidays and plug them into the year as needed? Of course that can't happen, but Richela Fabian Morgan - aka Crafty Richela - did the next best thing by making this festive Holidays banner from newspaper and magazine illustrations. She laminated images onto cardboard squares that were cut from detergent boxes, hand cut the letters, and stitched everything together. I'm using it as a Christmas mantel decoration, but because the pictures aren't holiday specific, it can stay there all year round! I have the sense Richela inspects every bit of her household trash and mulls over alternative uses. This little coin purse, for example, started out as a milk carton. It's incredibly durable and the flap adheres snugly with sewn-on Velcro. Richela sent me the above lovelies last Christmas and then, lo and behold, this past week I received another surprise. My very own All Things Paper tote bag! Admittedly the sturdy tote is not paper... it's made entirely of duct tape... blue and white retro flowers tape on the front, shiny silver sides and handles, and a white back. The lettering matches the font of my blog header - so cool. 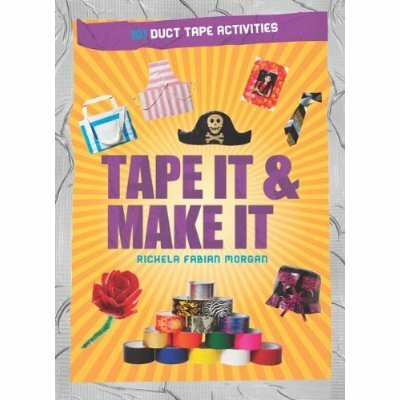 Richela recently authored the book Make It and Tape It: 101 Duct Tape Activities. I had no idea duct tape comes in so many pretty patterns and colors, and never in a million years would I have thought of so many novel uses for it! Richela has crafted something very special from an unusual, but easily obtainable paper crafting supply for the All Things Paper book that's due out this spring. So sorry to be a tease, but I think you'll enjoy her project! You are so welcome and same to you! Beautiful stuff - thanks Ann and Richela! Her holiday banner looks gorgeous . I am surprised too at what she has achieved with duct tape. I am shocked that the tote bag is made out of duct tape! Very interesting stuff. Ann, I wish all the best to you and your family this holiday season! I love seeing crafters upcyle. How inspiring. Her holiday mantle sign is wonderful and what a happy surprise to receive that duct tape tote!!!!! Clever, fun, useful, and lots of imagination!!! Love what she did!